In reading this poem I always think of the landmarks in central Virginia indicating important battles from the civil war. Each time the landscape before me is breathtakingly beautiful. And it is so hard to imagine what had happened there in the past. People are this way too. Everyone has had difficulties even though the scars don’t always show. Many times we only see the person as they are now, a pear tree in bloom, and we forget that each person has fought their share of battles. 1) ikusa is commonly written in kanji as 戦 and in hiragana as いくさ. I have used both in the designs. 2) Similarly I have used kuzure in both kanji as 崩れ and in hiragana as くずれ. 1) 梨 (nashi) means “pear” and, specifically, “pear tree”. 2) さく (saku) in this case means “to bloom”. 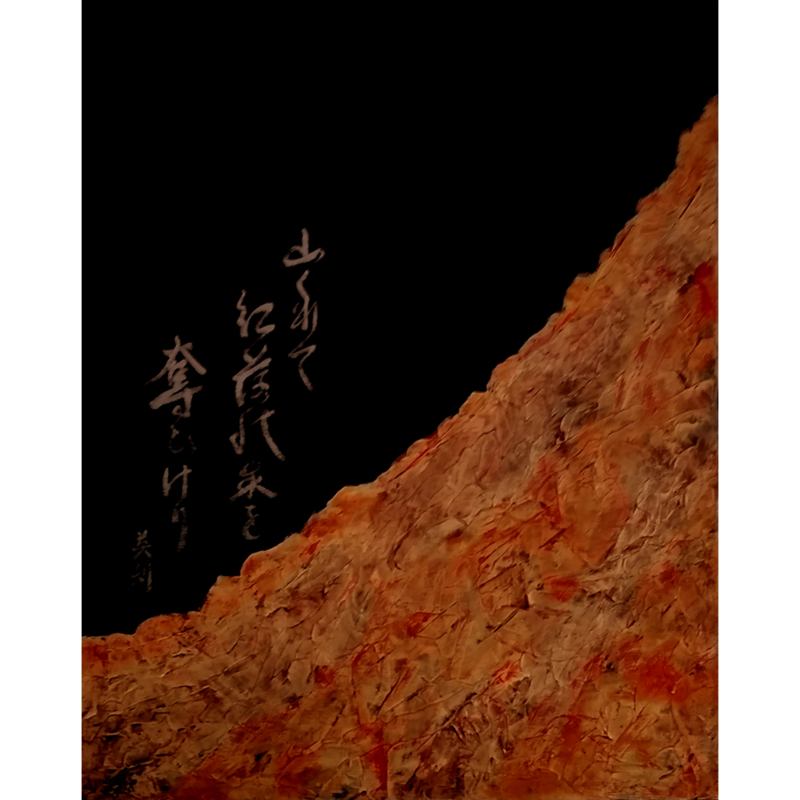 3) 戦のあと (ikusa no ato) meaning “ruins (remains) of a battle”. 戦 (ikusa) means “war; battle; campaign; fight”. あと (ato) in this case means “ruins; remains”. 4) 崩れ (kuzure) meaning “crumbling; collapse; ruin”. 5) 家 (ie) meaning “house; dwelling”. Translation by Timothy L. Jackowski, Takase Studios, LLC. Blyth, R. H. (1949). Haiku, Vol. 1: Eastern Culture . Tokyo. The Hokuseido Press. 166. Copyrights are retained by the original authors and used here under the Fair Use Doctrine. We encourage you to support the authors, as we have, by purchasing the referenced works. 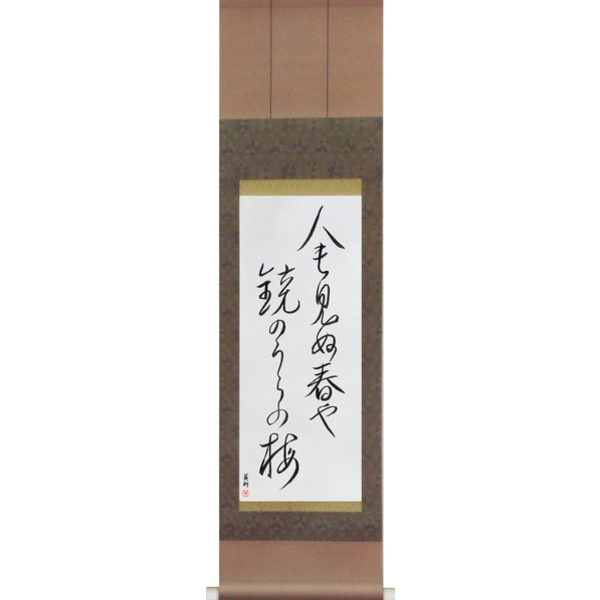 About The Art: This beautiful hand-brushed scroll by Master Takase is personally created at the time of your order and proudly bares her seal and signature. We exclusively import this high-quality scroll with light brown silk borders and fine Japanese paper from one of the finest scroll makers in Nara Japan. This is not a print but is hand-brushed to match the sample as closely as possible. This is a personal work of art that is designed to last generations. Delivery: The scroll is completed within 1-3 business days and is shipped from Master Takase's studio in the beautiful state of Washington. The scroll arrives ready to display.